Zachary Miller -- The Most Underrated Seahawk? 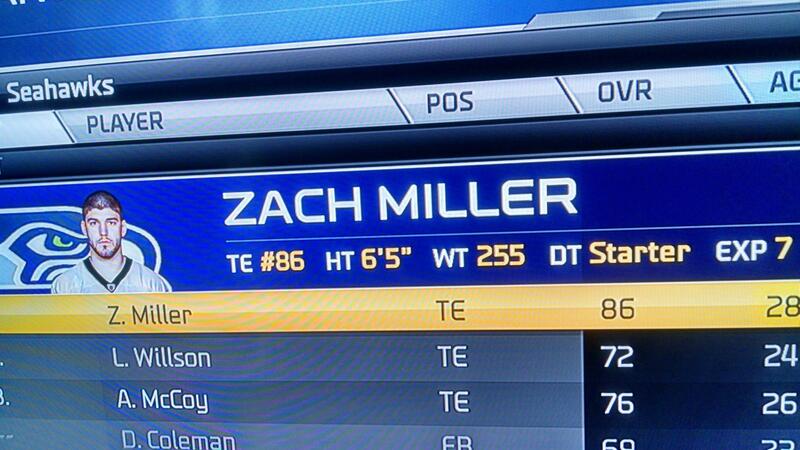 Zachary Miller — The Most Underrated Seahawk? Zachary Miller is a tight end who joined the Seattle Seahawks in 2011. He is truly an unsung hero for the team who had an incredible game against the Green Bay Packers -- yet I'm hardly hearing anything about him. In fact, Madden 15 even forgot what he looked like!He was a star at his Phoenix high school, a star at Arizona State University, and a second-round draft pick for the Oakland Raiders in 2006. With Oakland he had phenomenal success and was purchased by the Seahawks for $34 million. Against Green Bay he made an amazing one-handed grab to keep a drive alive in the second quarter, he made an early third-quarter third down conversion on a nifty crossing route, he consistently blew his competition off the line in the zone blocking scheme for Marshawn Lynch and maybe most importantly, he got up after being knocked down to punch the ball from a Green Bay linebacker who was about to intercept a tipped Russell Wilson pass. I'll be watching Miller more closely against San Diego next week!